As austerity bites and local authorities up and down the country struggle to provide services following cuts in central government expenditure and grants, communities are looking for alternative sources of investment. The £250bn Local Government Pension Scheme (LGPS) is being eyed as one possible source. In the recent past it was the Conservative chancellor, George Osborne, who wanted to turn the LGPS into a "British sovereign wealth fund" and direct it to invest in local infrastructure projects. That big idea fell away due to opposition from councils, which dislike being told what to do and also demanded that the government guarantee the money if it all goes horribly wrong. This time, the interest in the LGPS (and other pension funds) is from the Left. 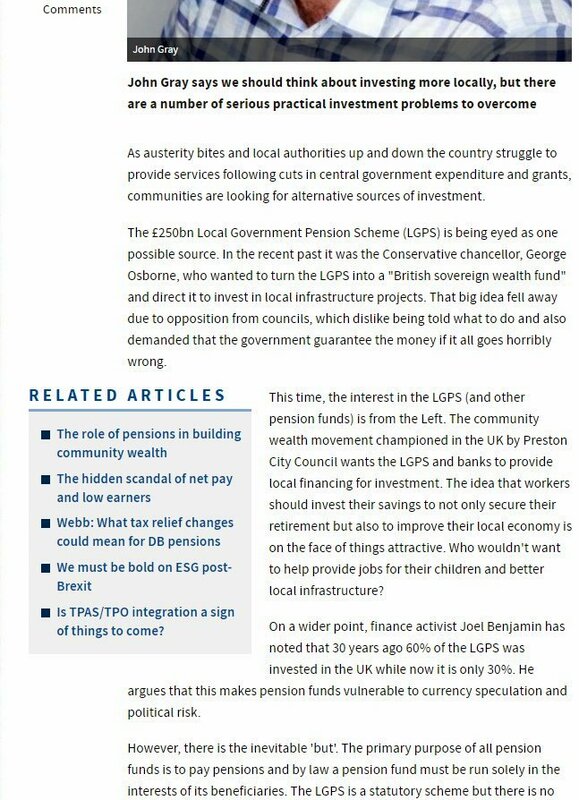 The community wealth movement championed in the UK by Preston City Council wants the LGPS and banks to provide local financing for investment. The idea that workers should invest their savings to not only secure their retirement but also to improve their local economy is on the face of things attractive. Who wouldn't want to help provide jobs for their children and better local infrastructure? On a wider point, finance activist Joel Benjamin has noted that 30 years ago 60% of the LGPS was invested in the UK while now it is only 30%. He argues that this makes pension funds vulnerable to currency speculation and political risk. However, there is the inevitable 'but'. The primary purpose of all pension funds is to pay pensions and by law a pension fund must be run solely in the interests of its beneficiaries. 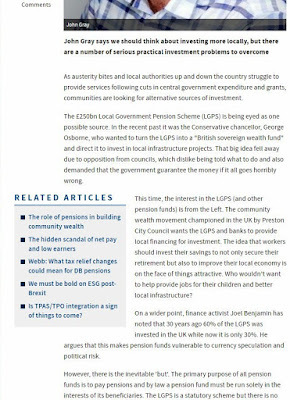 The LGPS is a statutory scheme but there is no Crown Promise and no Pension Protection Fund. While on one level it is unthinkable that pensions would not be paid, we now have a number of large councils showing signs of financial stress, and in February Northamptonshire County Council declared effective bankruptcy. The history of direct council investment in local projects has not been great, with too much money wasted on ill-thought-out 'vanity' projects. The Carillion and Capita private finance initiative disasters also remind us that it is far cheaper and safer in the long run for government to borrow money and invest, but all this doesn't mean there is no role for pension funds to invest locally. On the positive side, the LGPS is being effectively merged and scaled up in size into large £25bn plus 'pools'. This should mean they can widen their asset allocation, spread risk and acquire greater investment expertise. There is also a possible window of opportunity with the growth of the campaign to divest in fossil fuels and reinvest in new 'low carbon' green industries. There is currently around £14bn in the LGPS invested in fossil fuels. Some councils have already decided to disinvest within five years. So we should be thinking about investing more 'locally' as long as we deal with a number of serious practical investment problems to overcome such as the lack of accountability to beneficiaries (hardly any of the pools have employee representation) costs, risk, volatility, conflicts etc. Meanwhile, there is nothing stopping pension funds actively engaging with the companies they own and getting them to support other community wealth building measures, such as making sure they are responsible lenders or pay all their workers (including agency) the real national living wage, decent sickness and pension benefits; insource services; use local suppliers (especially mutual and other co-operatives); train and upskill their workers. In a landmark report by the Law Commission last year, it said: "There are no legal or regulatory barriers to pension schemes making social investments." Hopefully the time has come for pensions to play its part in community wealth building.